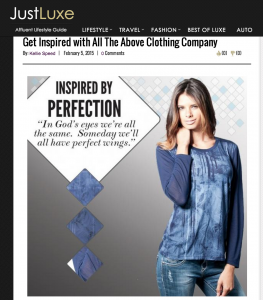 Congratulations to our Client All The Above Clothing for their feature on JustLuxe! All The Above Clothing Company has a lot to be inspired about these days. The company not only gives back with every garment, but each piece comes with an inspirational quote, lyric or phrase that inspired the designer to create the look. All of the inspirations are gathered from Facebook fans and other followers, who receive credit for their input on the inside print of each item. The companyâ€™s mission is to bring current trends to their customers’ eyes while building awareness for programs and nonprofits in need. ATAÂ Clothing offers everyone the opportunity to wearÂ theÂ looksÂ they love while supporting theÂ causes near and dear toÂ their hearts. At checkout, customers are prompted to selectÂ theÂ charity or nonprofit that aligns withÂ their mission from a diverse listing of organizationsÂ allÂ overÂ theÂ world. ATA Clothing donates 10% of the proceeds to the chosen cause. For an even bigger impact, customers can shop from the Gives collection, which donates 100% of the proceeds to the specified charity. Check them out at ata-clothing.com!